When I received an email inviting me on a trip to Geneva to look around the Caran d’Ache Factory my first thought was this is too good to be true! 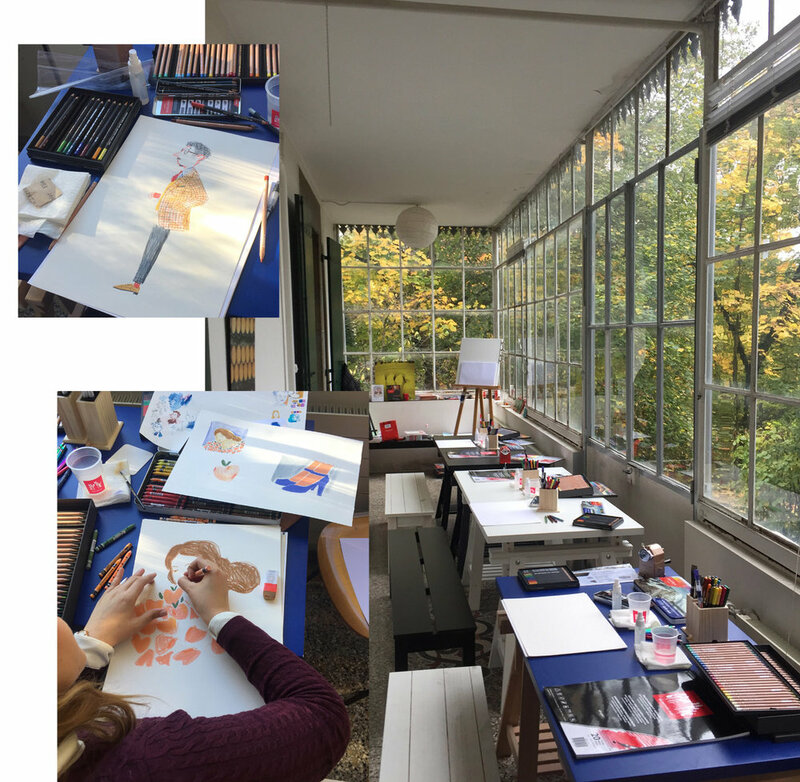 But I said yes and VERY surreal but last week I was flown to Geneva with 7 other illustrators! 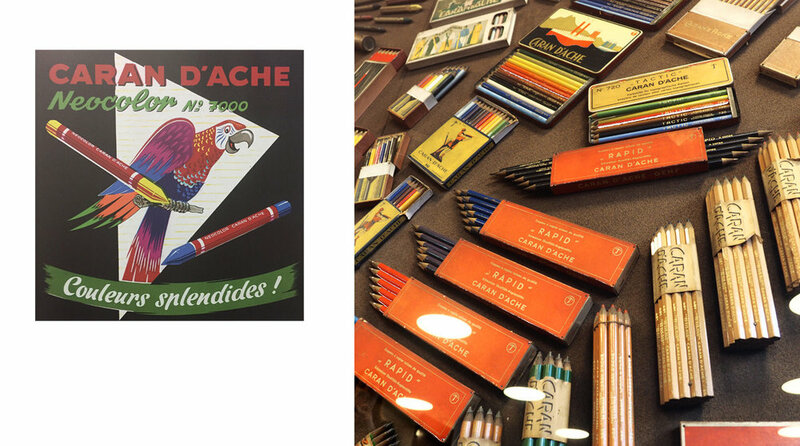 First stop the Caran d’Ache factory where we were greeted by this amazing display of the Caran d’Ache range (below) from 1915! I drool over vintage packaging at the best of times so this was heaven! Plus lots of vintage graphics from their posters through the years were all around! Swoon! I always love vintage advertising and packaging! But then we get to the REALLY good bit; meeting Eric Vitus whose actual job title is ‘Master of Colours’! He showed us around the factory explaining how and why the Caran d’ache products are manufactured in the way that they are! Basically always working towards maximum colour saturation, so interesting! Check out the pigments below which were SO saturated my camera struggled to focus! So much colour inspiration around the factory! Next up we went to the Caran d’Ache house for some delicious lunch and then an amazing demonstration of the ways in which the products can be used! Ambassador for the brand Adrian Weber showed us some really interesting techniques such as using the water soluble aspects of some of the Supracolor and Neocolor 2 as well as demonstrating how saturated the colours are! Mmmmmmm! Then it was play time as we got to experiment with the range! I was super nervous to draw especially as I was surrounded by all these amazing illustrators! >.< Luckily I got on with it and started doodling some of the bits I’d been messing around with in my sketchbook; matchbooks and travel ephemera are my current obsession! I really enjoyed working with the Luminance colour pencils which are so vivid in colour which I’m ALL about! I actually started experimenting with combining these with the Fibralo brush markers and loved the effect so I’ll definetly be doing more of that in my work! 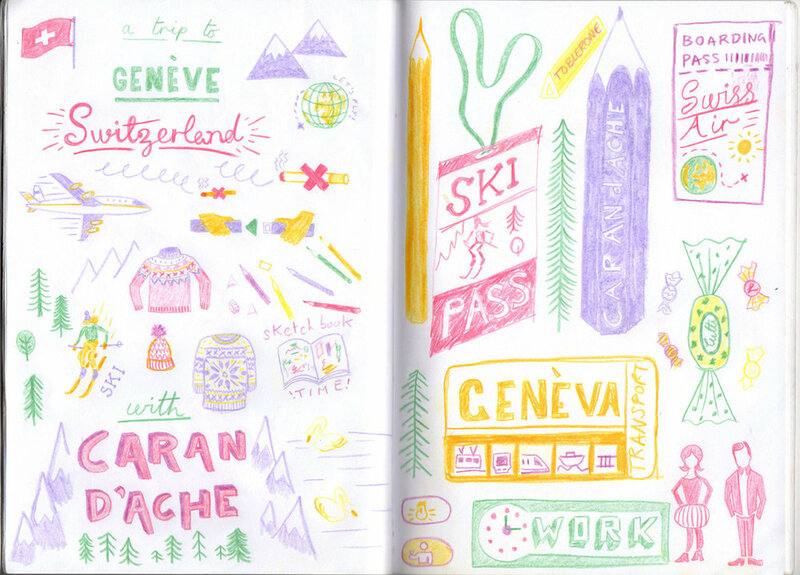 Here is the sketchbook spread that I was working on while on the trip! This is all drawn using Supracolor Soft pencils! I really liked what I came up with in my sketchbook and during the drawing session so I decided to work up some final illustrations using Luminance colour pencils that I bought at the Caran d’Ache shop on the trip! Again lots’s of paper ephemera such as tickets, the little signage bits that you find on Aeroplanes plus some of the awesome vintage typography that I saw at the Caran d’Ache head office!